Showing some leg: Harvard’s Jake McIntyre kicks off, accompanied by sophomore linebacker Jordan Hill. McIntyre’s first-quarter three-pointer moved him into second place all-time among Crimson field-goal kickers. 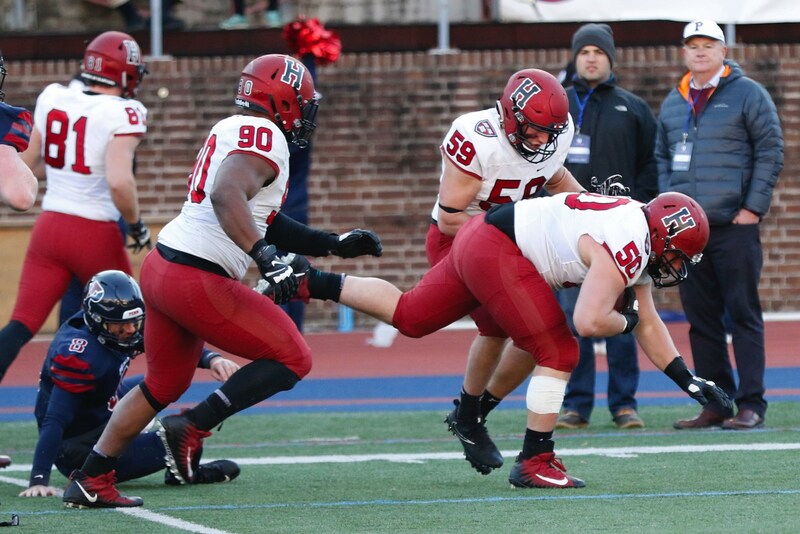 Pigskin pounce: Harvard's senior defensive tackle Richie Ryan wraps up the fumble committed by Penn quarterback Nick Robinson (8). Convoying Ryan are junior defensive lineman Brogan McPartland (81), senior tackle Stone Hart (90), and junior linebacker Joey Goodman (59). 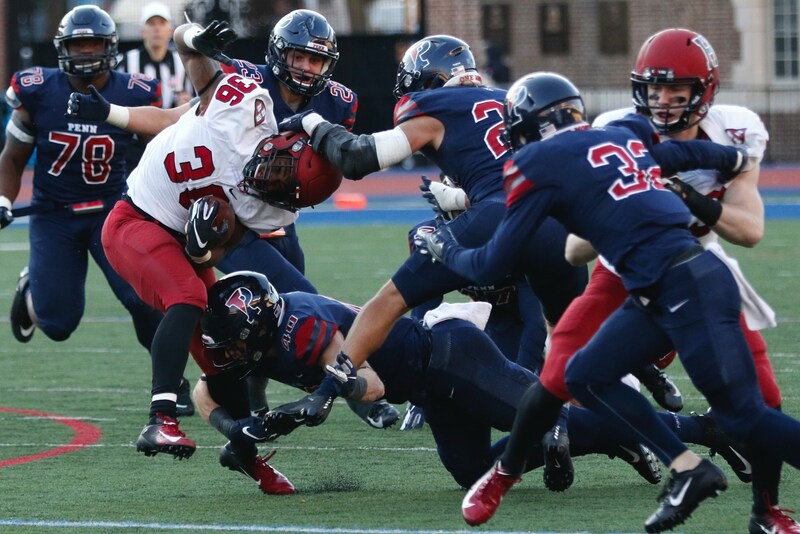 That sideways feeling: Harvard’s Devin Darrington gets hit high and low by a gang of Quakers. The Crimson sophomore runner shook off the tackle and went on to score Harvard’s final touchdown. Harvard football coach Tim Murphy is fond of saying, “It’s what up front that counts.” On Saturday at Franklin Field against longtime Ivy rival Penn, there was much for Murphy to be fond of as his Crimson offensive and defensive lines—the latter pulling off a magnificent goal-line stand—dominated the unexpectedly bumbling Quakers in a bludgeoning 29-7 victory. The triumph, coming in the season’s final road game, lifted Harvard to 5-4 overall and 3-3 in the Ivy League. Penn dropped to 6-3, 3-3. With only one game left, the win guaranteed the Crimson a twentieth consecutive non-losing season. The Crimson prevailed despite seeing its starting quarterback, senior Tom Stewart, knocked out of the game by a Penn tackler during the second quarter. Stewart was coming off a five-touchdown-pass performance in a 52-18 victory over Columbia, an outing that earned him Ivy League co-offensive player of the week honors. Stewart, who to that point was a mere 2-for-7 passing, was replaced by sophomore Jake Smith (whom Stewart had supplanted as the starter in midseason). Smith played solidly, going 7-for-11 and tossing for two touchdowns to senior wideout Brian Dunlap. In truth, on this windy day both Harvard quarterbacks usually needed only to hand off to one of Harvard’s troika of running backs, senior Charlie Booker III and sophomores Aaron Shampklin and Devin Darrington, and watch them plow ahead behind holes created by their interior linemen: senior left tackle Tim O’Brien, sophomore left guard Eric Wilson, senior center Ben Shoults, senior right guard Larry Allen, and junior right tackle Liam Shanahan. Shampklin carried 16 times for a game-high 84 yards, Booker 17 for 74 and a touchdown, and Darrington 10 for 56 and a score. The Crimson piled up 215 yards on the ground. 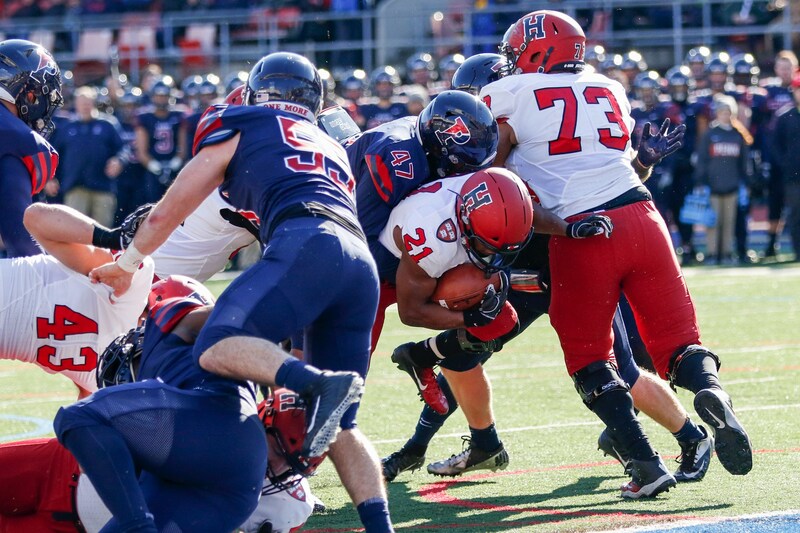 The Harvard defense, meantime, held Penn to 58 yards rushing on 32 attempts. The Quakers also committed four turnovers (two fumbles lost, two interceptions). As so often has happened this season, Harvard scored early. The Crimson’s first touchdown came after an exchange of interceptions, Conor O’Brien picking off Stewart at the Penn 20 (the first interception thrown by Stewart this season) and Harvard’s sophomore defensive back Max Jones returning the favor off of Penn’s Ryan Glover. Jones returned the ball 10 yards to the Quakers 29. Four plays later, Booker, with a mighty push at the end, smashed into the end zone. Junior Jake McIntyre booted the extra point. Harvard 7, Penn 0. On the Crimson’s next series Stewart took the Crimson 64 yards, 27 of which came on passes to sophomore wideout Tyler Adams. The drive stalled at the Quakers’ three—yet another instance of Harvard’s season-long troubles in the red zone. The Crimson settled for a 20-yard McIntyre field goal. Harvard 10, Penn 0. Now Penn got something going, and this might be where the game was irretrievably won—and lost. Glover took the Quakers from the Penn 40 to the Crimson one; the final play was a diving, finger-tip catch by wideout Mike Akai. On first and goal, Glover was stuffed by senior tackles Stone Hart and Richie Ryan. On second and goal, Karekin Brooks was stood up by senior defensive back and captain Zach Miller and junior linebacker Bobby Drysdale. On third and goal Brooks was stopped by Miller and junior linebacker Matt Farber. Fourth and goal. Penn coach Ray Priore had a decision: take the points in the form of a chip-shot field goal, or make one last try to get the ball over the goal? Priore chose to go for it. This time, forsaking the run, Glover tried to hit Brooks with a pass in the end zone. Incomplete! Crimson ball! With 4:46 left in the half, Harvard took over at its 26—and the offensive line truly began imposing its will on the Penn line. On four rushes, Booker gained 50 yards. Darrington carried twice for 15. On first and goal at the Penn nine, off a play-action fake, Smith whistled a pass in the end zone to Dunlap. On the extra-point try, the snap went through the hands of Smith, the holder. Harvard 16, Penn 0. The half ended shortly thereafter. For the Crimson, it had been darned near perfect. In the first 30 minutes, Harvard not only had blanked the Quakers but also had outgained them, 195 yards to 94, and won the battle of possession, 20:26 to 9:34. The Crimson salted the game away in the third quarter. As with their first touchdown of the game, their first score of the second half was set up by an interception. Senior defensive back Wesley Ogsbury, playing centerfield, grabbed a Robinson pass at the Harvard 41 and ran it back to the Penn 39. (It was Ogsbury’s sixth pick of the season, which is tied for second in the Ivy League.) Nine plays later, on third-and-five from the Penn 12, Smith took the snap, danced to the right, then threw on the run to Dunlap in back of the end zone. Touchdown! On the extra point, Harvard went for two but Smith was sacked. Harvard 22, Penn 0. The Quakers had not plumbed the depths of their degradation. On the ensuing series, on first down from the Penn 25, Robinson dropped back and, feeling the heat, just plain dropped the ball. Ryan fell on it at the 10-yard line. On the next play, Darrington pranced up the middle and into the end zone. 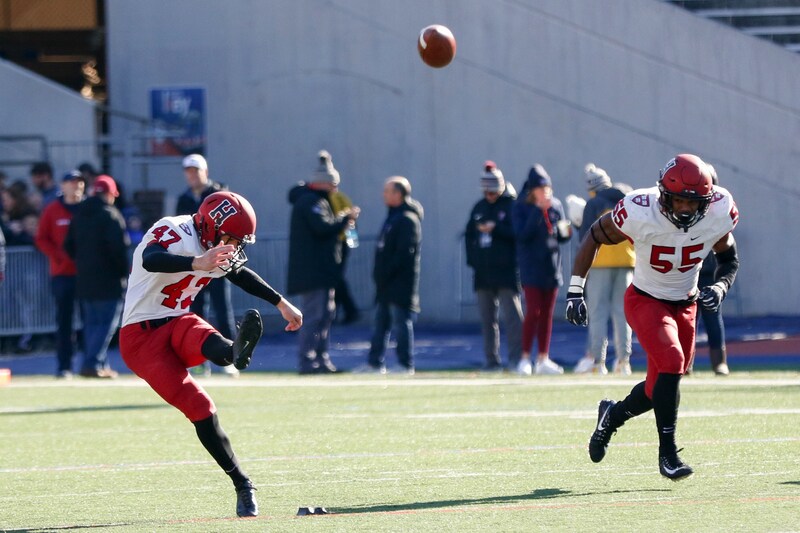 This time McIntyre got an opportunity to kick the extra point, which split the uprights. Harvard 29, Penn 0. Soon thereafter, Glover was back, and now he was throwing. He completed four passes, the last a 23-yard touchdown toss to wideout Kolton Huber. Jack Soslow kicked the extra point. Harvard 29, Penn 7. Ten minutes remained, and the Crimson chewed up almost eight of them with a 66-yard drive that didn’t produce a score but kept the ball safely out of Quaker hands and clinched the victory. Murphy also likes to say that he wants Harvard to be playing its best football in November. That has been the case this season. The last two weeks have provided considerable momentum going into the finale against Yale. The Elis have shown awesome firepower under freshman quarterback Griffin O’Connor, a midseason sub for the injured Harvard-destroying Kurt Rawlings. They also have in JP Shohfi and Reed Klubnik the kind of athletic wide receivers who have given the Crimson trouble this season. Harvard has been more solid, and Shampklin could run wild against the Yale defense. In other words…a toss-up. Tidbits. Sophomore Aaron Shampklin’s 84 rushing yards on Saturday gave him 1,000 for the season, which leads the Ivy League in the category….Junior Jake McIntyre’s first-quarter field goal was the twenty-ninth of his career, one shy of the Crimson record held by Matt Schindel ’08….Saturday’s victory broke a three-game losing streak to Penn and was coach Tim Murphy’s first win over Quakers coach Ray Priore. Coming up: You have to ask? The 135th playing of The Game, at Fenway Park—the first time since 1894 that Harvard has played Yale at other than one of the schools’ facilities. (This is nominally a Harvard home game.) Kickoff: 12:30 p.m. ET. The contest will be telecast on ESPN2 and will be broadcast on the radio on WRCA 1330 AM, 106.1 FM and 94.5 FM-HD2, and on WHRB FM 95.3. Like the Crimson, the Elis are 5-4 overall and 3-3 in the Ivy League. Yale leads in the overall series 67-59-8 and has won the last two, including 24-3 last year in New Haven. This is the fiftieth anniversary of 1968’s famed “Harvard Beats Yale 29-29” game ; the captains from those teams will help conduct the pregame coin toss and there will be a ceremony at halftime featuring players from both teams. We approach this Fenway thing with considerable skepticism. We were a season-ticket holder of the Boston Patriots in the 1960s when the Pats played their home games at Fenway. The “lyric little bandbox of a ballpark,” as John Updike ’54 scl, Litt.D. ’92, so memorably put it in his classic piece “Hub Fans Bid Kid Adieu,” has unequaled history and charm but is not built for football. (It can be tough even to watch baseball there if you’re behind a post.) Besides, how can you improve upon or even match Harvard Stadium? Then again, as a cranky aged man, we are resistant to change of any kind. So we will let this one play out before rendering a final judgment.